I tried a new stream and it was rugged. It took about an hour just to get to a fishable part of the creek. Half that mile was basically bush whacking. I wanted to take a picture of the trail but wouldn't have done it justice. We were earning the fish on this day. Heading up the trail we were breathing hard and eating spider webs. Finally we got to a place where we could go after brookies. With all the rain we've had this year the river was obviously higher than normal. There were still plenty of pools to fish but it was really hard getting a proper drift. The foliage was a whole different challenge. Even with the obstacles I was able to catch a fish after just a few casts. The success was deceiving. The first fish was easy but the rest were very tough. It took a couple of hours for my buddy to catch his first brookie ever. This fish made the hike worth it. We hooked plenty more but your first brookie is always special. My buddy was fishing a L.L. Bean 5'9 3wt Streamlight. This is a pretty sweet rod for $100. I was really impressed with how it performed. I'd be lying if I said my last fishing trip wasn't some what disappointing. I had caught what I thought was my first wild NC Brookie only to learn later that it wasn't the case. I tried another stream yesterday that was rumored to hold a good population of fish. I went with low expectations. The first pool looked great but didn't relinquish any fish. It was the first spot right off the trail. I would have been surprised if I did catch something. I tried several other pools and on my 3rd I actually had a nice rise. The fish hit right at the end of the run just as the fly was about to go over a spillway. The fish was on for a few seconds then came off. Each pool had a similar scenario. I'd cast and a fish would hit within seconds they'd come off. I wasn't sure if the fly was too big or if I was just doing something wrong. I tried to not think about things so much and enjoyed the view. Fish continued to hit my fly without getting hooked. Eventually after what seemed like infinite missed strikes a fish was hooked. Finally! A real NC brookie. The color was so much different than the other fish I caught. Comparing the two there is no question which fish is truly a wild brookie. With the pressure off the fish seemed to come easier. I was catching more and missing less. Towards the end of the day in a deep cool I caught my biggest fish. Can you guess which fly I used? When is a fish wild? 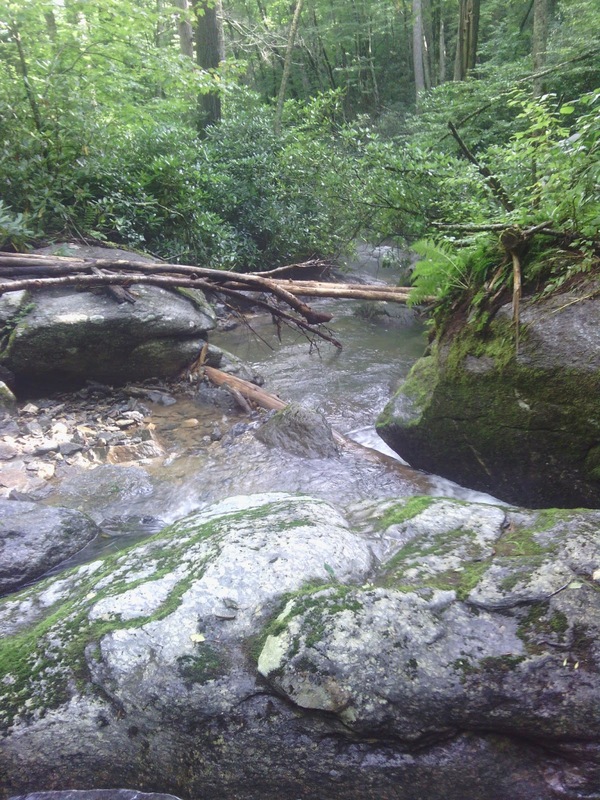 In my last post I talked about going to a wild stream. 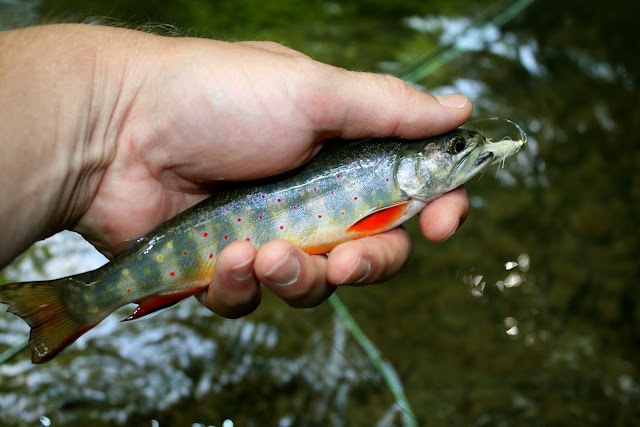 I thought I had caught my first NC brook trout. Come to find out these fish were most likely stocked fish that had moved up a tributary. My friend and I started to have the discussion about when is a fish defined as wild? We both have the opinion that if a fish lives in a certain stream at some point it is a wild fish. It has learned the survival skills to live in its environment. There is a lot of controversy in North Carolina over this term "wild". Some people classify native fish as wild where others hate this term. 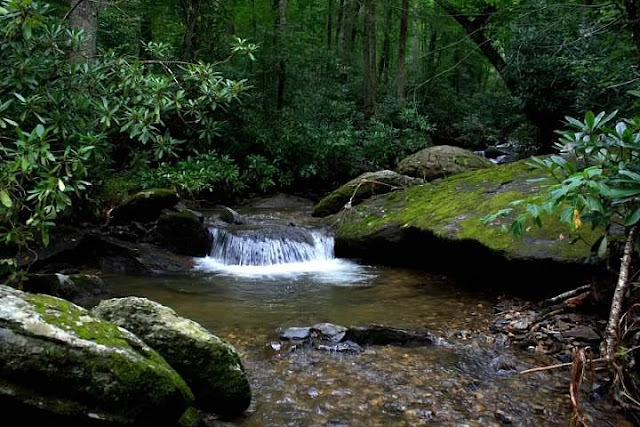 They like to call stream born fish native and fish that have moved into a water system and survived wild. That throws in a new factor. If a fish moves into a territory then has offspring are those fry now native? You can see how this can get complicated and to make matters worse even biologists have a hard time finding out exactly which fish are native anymore. I wonder if a new classification will be determined soon. Fish that haven't been found in certain areas are discovered all the time. 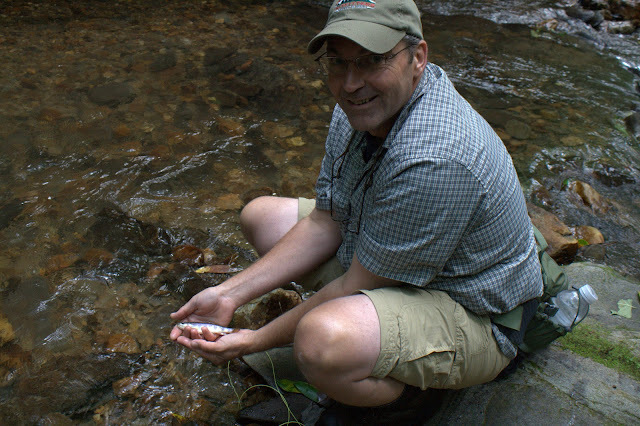 Recently I participated in a brook trout survey where we found smallmouth high up in a mtn stream. 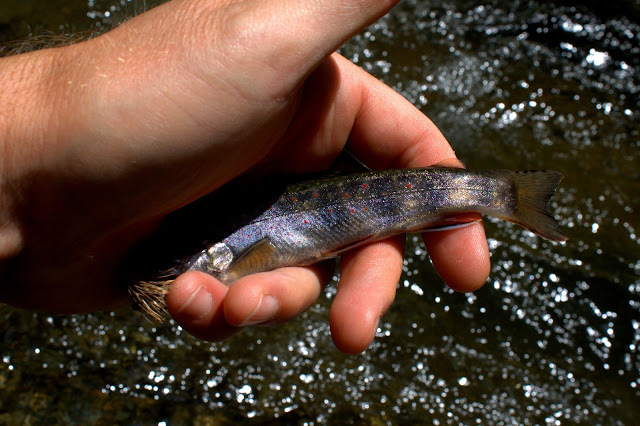 As neat as it was to find them this is bad news for trout. 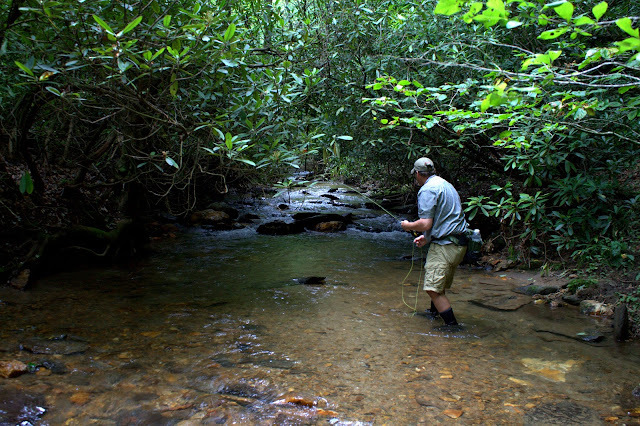 Smallmouth can easily become the dominant predator in a small trout stream. Are we kidding ourselves by trying to catch a fish that is truly native? I'd like to hear others opinions about this and when is a fish considered wild? Whenever you go fishing there's usually one place that captivates you so much you can waste your whole day there. A buddy and I went to a wild stream and we found such a place. Really we found more than one. 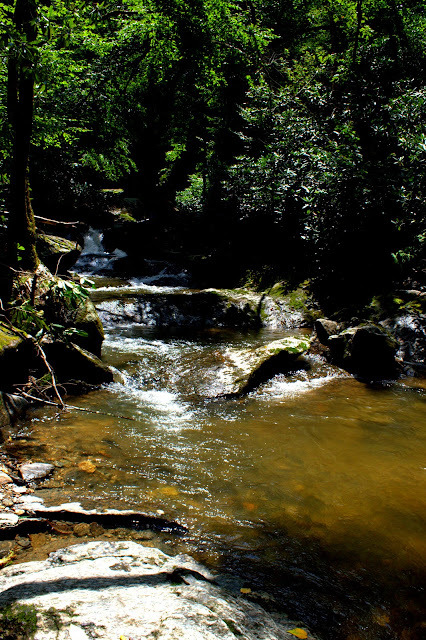 This creek has pools that make you afraid to move on because you can't believe there is anything better. Then reluctantly you hike on and around the next bend, unbelievably, there is another one almost prettier than the first. The fish aren't shabby either. This was my first NC wild brookie. It wasn't displaying its fall colors but it was still beautiful to me. 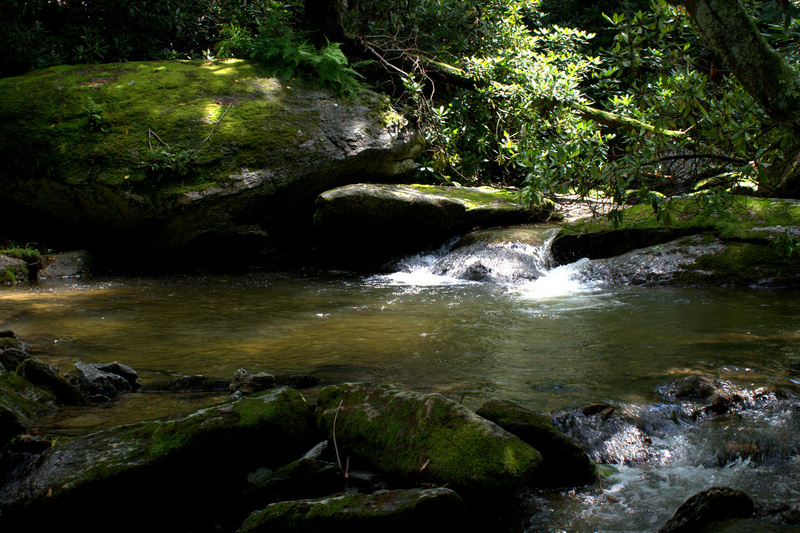 Visiting these streams always makes me wonder why I don't fish them more. My buddy and I were the only people we saw all day. In this pool I missed a good sized fish. The fish hit on the next two casts and on the third I hooked up. The average size wild fish in this area is around 8 inches. This fish was well beyond that. I figured it was a rainbow. When I got it close I realized it was a brookie. The biggest wild one I had ever seen. The fish had an almost kiped jaw which made me wonder about it's age. The fish was 11 inches and released hopefully with not too much harm. We headed out not long after that. We couldn't see the day getting much better.